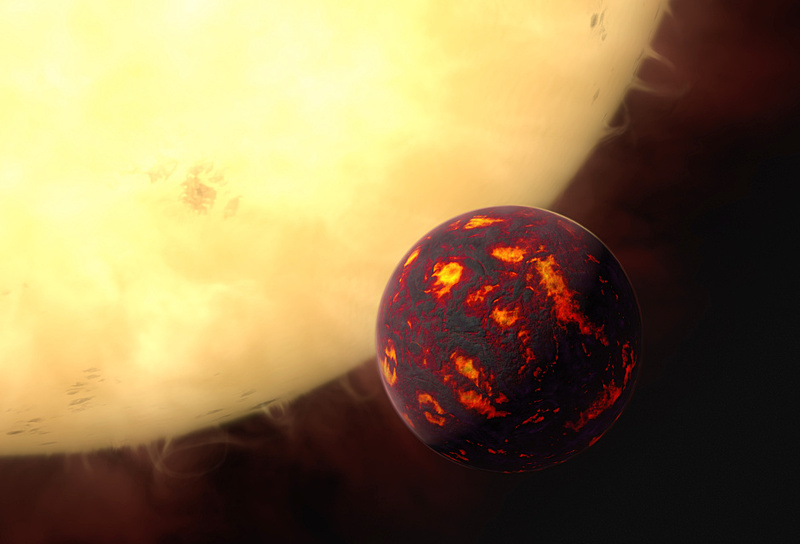 This artist’s impression shows the super-Earth 55 Cancri e in front of its parent star. Using observations made with the NASA/ESA Hubble Space Telescope and new analytic software scientists were able to analyse the composition of its atmosphere. It was the first time this was possible for a super-Earth. 55 Cancri e is about 40 light-years away and orbits a star slightly smaller, cooler and less bright than our Sun. As the planet is so close to its parent star, one year lasts only 18 hours and temperatures on the surface are thought to reach around 2000 degrees Celsius. Image credit: ESA/Hubble, M. Kornmesser. The international team, led by scientists from University College London (UCL), took observations of the nearby exoplanet 55 Cancri e, a super-Earth with a mass of eight Earth-masses. It is located in the planetary system of 55 Cancri, a star about 40 light-years from Earth. 55 Cancri e, however, is an unusual super-Earth as it orbits very close to its parent star. A year on the exoplanet lasts for only 18 hours and temperatures on the surface are thought to reach around 2,000 degrees Celsius. 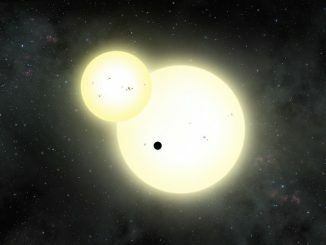 Because the exoplanet is orbiting its bright parent star at such a small distance, the team was able to use new analysis techniques to extract information about the planet, during its transits in front of the host star. “This result gives a first insight into the atmosphere of a super-Earth. We now have clues as to what the planet is currently like and how it might have formed and evolved, and this has important implications for 55 Cancri e and other super-Earths,” said Giovanna Tinetti, also from UCL in the UK. 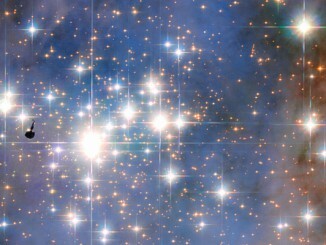 Some of the Milky Way’s “celebrity stars” — opulent, attention-getting, and short-lived — can be found in this Hubble Space Telescope image of the glittering star cluster called Trumpler 14. 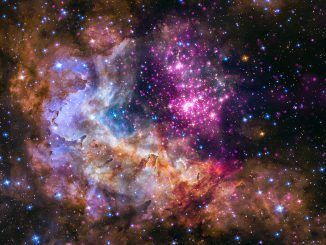 It is only 500,000 years old, has one of the highest concentrations of massive, luminous stars in the entire Galaxy and is located 8,000 light-years away in the Carina Nebula. Each year, NASA’s Chandra X-ray Observatory helps celebrate American Archive Month by releasing a collection of images using X-ray data. Each of these six new images — representing just a small fraction of the treasures that reside in Chandra’s unique archive — also includes data from telescopes covering other parts of the electromagnetic spectrum, such as visible and infrared light.